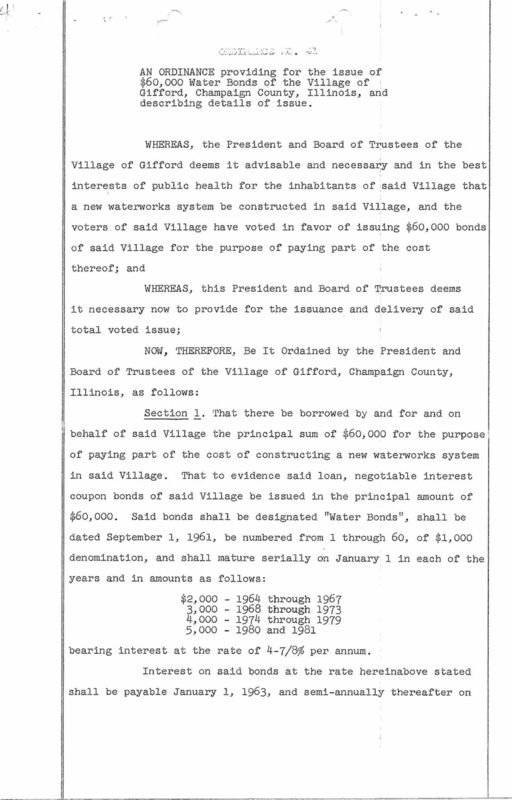 AN ORDINANCE providing for the issue of $60,000 Water Bonds of the Village of Gifford, Champaign County, Illinois, and describing details of issue. 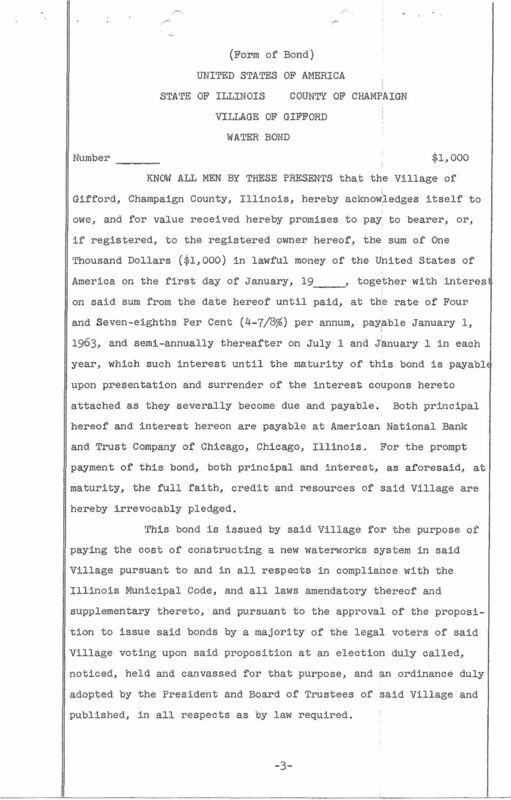 Download "AN ORDINANCE providing for the issue of $60,000 Water Bonds of the Village of Gifford, Champaign County, Illinois, and describing details of issue." 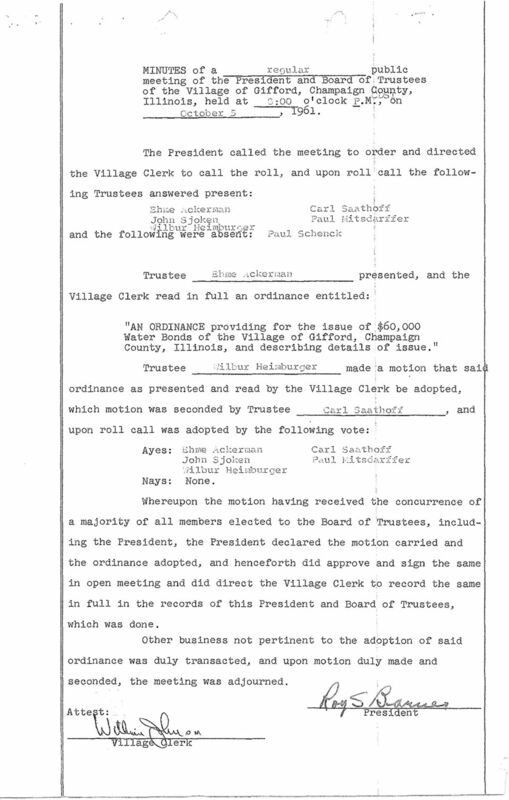 7 MINUTES of a reoular public meeting of the President and Board of Trustees of the Village of Gifford, Champaign Co.J3nty, Illinois, held at ~ :00 o 1 clock P.M':~'' 6n c"",""c-"t"'o""b'-'e'-'r"-..o"'"", The President called the meeting to order and directed the Village Clerk to call the roll, and upon roll call the following Trustees answered present: and the Eh:o:~e ":..cl:e rr11:::\n J9hl1 S j q_k?n_ - JJ-1bur I~JeJ.mLJur( ier follmnng were absent: :1?aul fii t Trustee Village Clerk read in full an ordinance entitled: presented, and the "AN ORDINANCE providing for the issue of $60,000 Water Bonds of the Village of Gifford, Champaign County, Illinois, and describing details of issue." 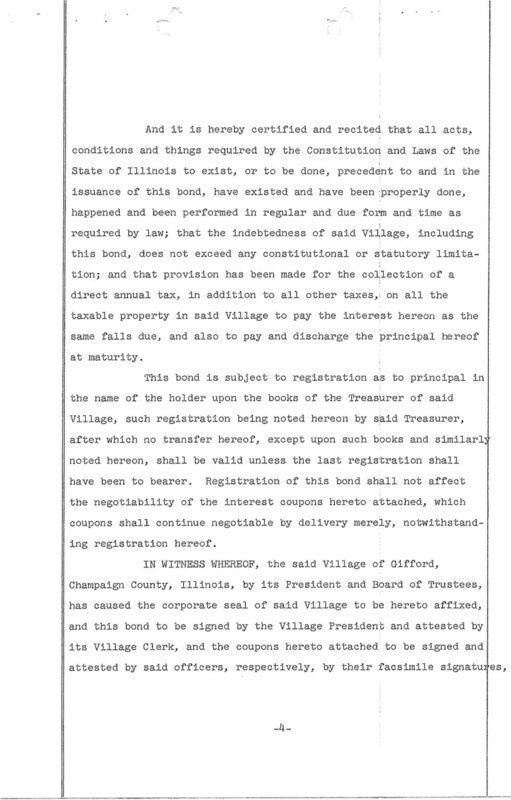 Trustee :_i_l_l_u_r_~_ie_~ i_m_b_u_r~c~;e_l_- made a motion that sai ordinance as presented and read by the Village Clerk be adopted, which motion was seconded by Trustee upon roll call was adopted by the following vote: Ayes: L~hme _::._ckeruc:u.1 Jol"n1 Sjo}::en.Jilbu. :r Fleiwburge:r Nays: None. Carl Sa.:~tho,~_:;,,.... 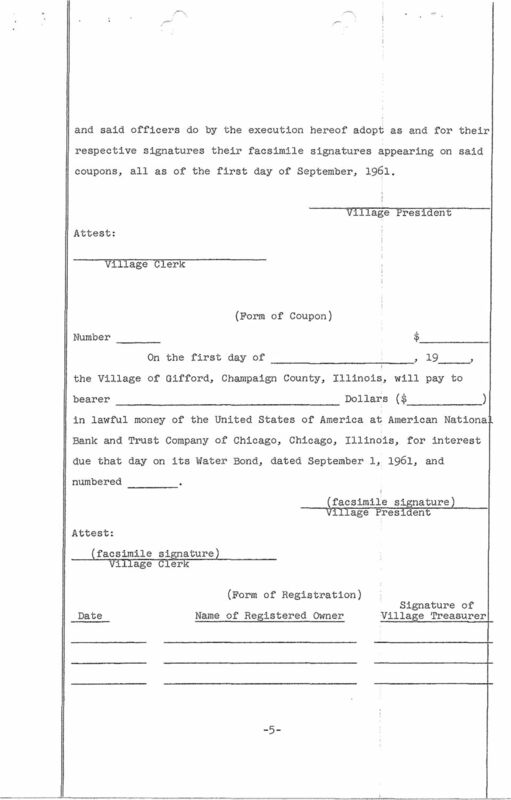 ul Li tsdarf:fer Whereupon the motion having received the concurrence of a majority of all members elected to the Board of Trustees, including the President, the President declared the motion carried and the ordinance adopted, and henceforth did approve and sign the same in open meeting and did direct the Village Clerk to record the same in full in the records of this President and Board of Trustees, which was done. Other business not pertinent to the adoption of said ordinance was duly transacted, and upon motion duly made and seconded, the meeting was adjourned. 421033-49. The City Council of the City of North Liberty, Iowa, met on October 23, 2012, at o clock.m., at the, North Liberty, Iowa. ATTACHMENT A HCIDL A Request for Issuance of Bonds for Skid Row Southeast 1. Resolution for Skid Row Southeast 1 on next page. ORDINANCE NO. 1346 MUNICIPAL COUNCIL MUNICIPALITY OF MONROEVILLE. Legislative findings and declaration of purpose. Pennsylvania Economic Revitalization Fund. REGULAR MEETING JANUARY 23, 2006. Mr. Hayes moved seconded by Mr. Mabee to approve the agenda for the regular January 23, 2006 meeting with addendum. The public portion of the meeting was opened. No comment at this time. 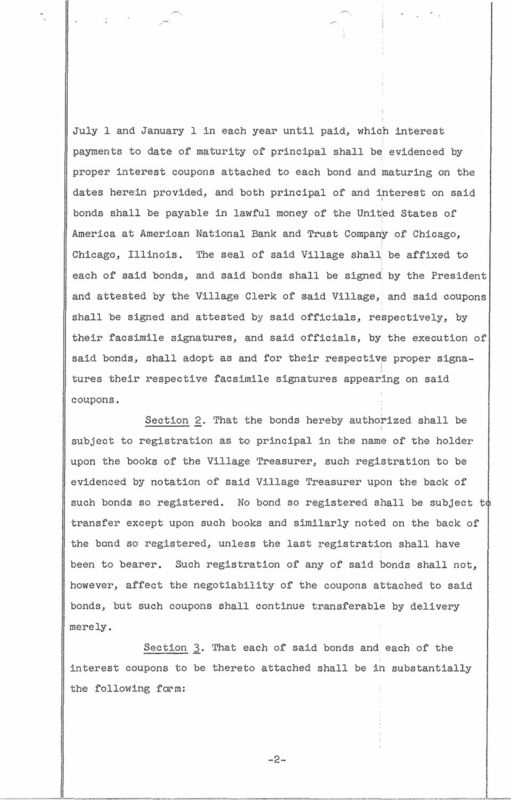 AMENDED ARTICLES OF INCORPORATION OF FIFTH THIRD BANCORP, AS AMENDED. The name of the corporation shall be FIFTH THIRD BANCORP. 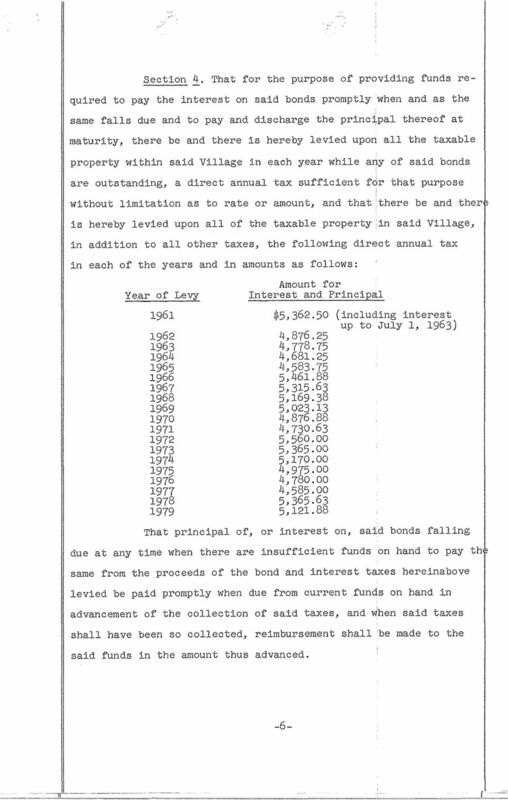 The officers of the Village shall consist of a Village President, six Trustees and a Village Clerk. Special Meeting Agenda Owosso DDA/Main Street Tuesday April 28, 2015, 7:30 a.m. Owosso City Council Chambers, 301 W Main St.
5:36-4 STANDARDIZED FORMS FOR PERFORMANCE GUARANTEES 5:36-4.1 Performance surety bonds The standardized form of performance surety bond required by an approving authority pursuant to section 41 of P.L.